Zebulon Turrentine has been around wood and music for his entire life. He was born in a log cabin in the USA so it seems as if it was fated that Zebulon would end up combining music and wood as beautiful and mellifluous instruments. 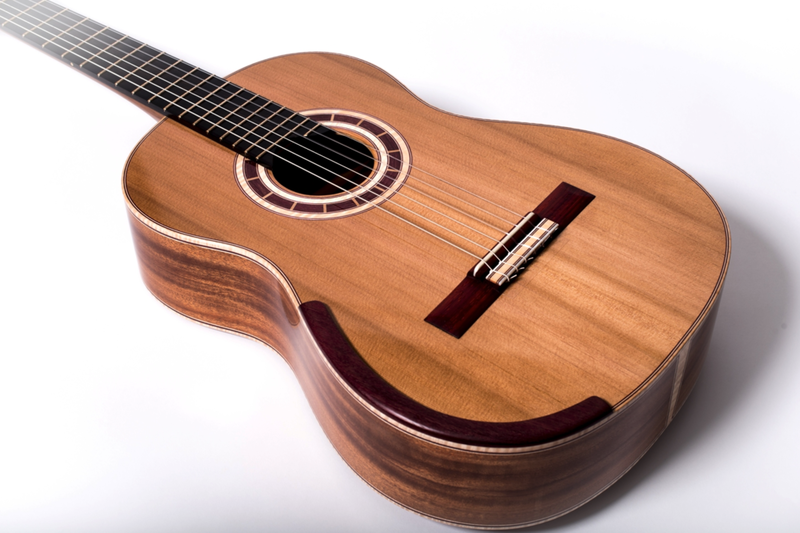 Awesomely Zebulon is not just a luthier but he's also a graduate performer with a Bachelor's degree in Classical Guitar Performance from Shenandoah University! How cool is that? To add to fate Zebulon's 6th grade teacher was the daughter of a fabulous guitar maker - Don Gallagher the son of J. W. Gallagher of Gallagher Guitar Co. There's that lovely Western Red Cedar top with assymetric lattice bracing. The guitar was commissioned as the 1st prize for the University of Louisville Florida 2015 Guitar competition - and what a prize it truly was. There isn't too much information around about this guitar on Zebulon's website apart from why it was made, what is was made for, and what is was made from. However it doesn't matter as we have plenty of pictures to drool over. Zebulon now has a workshop in Cookeville, Tennessee in the United States of America. He's happy for anyone to give him a call or stop by for lunch! Don't miss my other blogs showcasing some of the world's most beautiful & unusual guitars.